Solid wood cutlery drawers are a new addition to our existing range of kitchen accessories and come in a variety of beautiful hardwood choices in a number of sizes, spanning from 310mm all the way up to 910mm wide. Each cutlery drawer is created from the same timber as our high-quality wood worktops and is manufactured in-house using our precise CNC machine. The machine cuts the separate cutlery inserts into the solid hardwood block, engraves each section to specify which type of cutlery the tray is for, and after being removed from the machine is then sanded by hand to create an incredibly smooth finish. Whilst our cutlery trays are not supplied with any treatment applied, we recommend either covering them with a couple of coats of Rustins Danish Oil, lacquer, or painting them to match your kitchen. Traditional oak timber forms the basis of our most popular worktop option, and is also ideal for creating matching cutlery drawer trays. This hard-wearing and resilient timber is perfect for creating kitchen accessories such as these, whilst suiting a variety of kitchen themes – whether modern or traditional. Prices start at £50 for a 310mm tray. This great value hardwood has a warm colouration and fine grain pattern, and is naturally very hard-wearing – the perfect accessory to complement wood kitchen cabinets, drawers and worktops. Choose from sizes ranging from 310mm all the way up to 910mm to suit even the largest kitchen drawers. Prices start at just £48.50 for a 310mm tray. A luxurious, dark timber, our black American walnut cutlery drawer trays have an unmistakable aesthetic (and make gorgeous worktops for a contemporary kitchen). A smooth and incredibly hard-wearing timber, these cutlery drawer inserts should last many years if intermittently treated with Danish oil. Prices start at £65 for a 310mm tray. Whether in a modern or traditional scheme, the golden tones of this exotic African timber make it ideal for many solid wood kitchens, as well as being the perfect material for creating matching cutlery drawer inserts. With hard-wearing and naturally anti-bacterial qualities, iroko cutlery trays will provide years of service within your kitchen. Prices start at £55 for a 310mm tray. Stylish finishing touches – such as our cutlery drawer trays – help to make a solid wood kitchen truly unique. 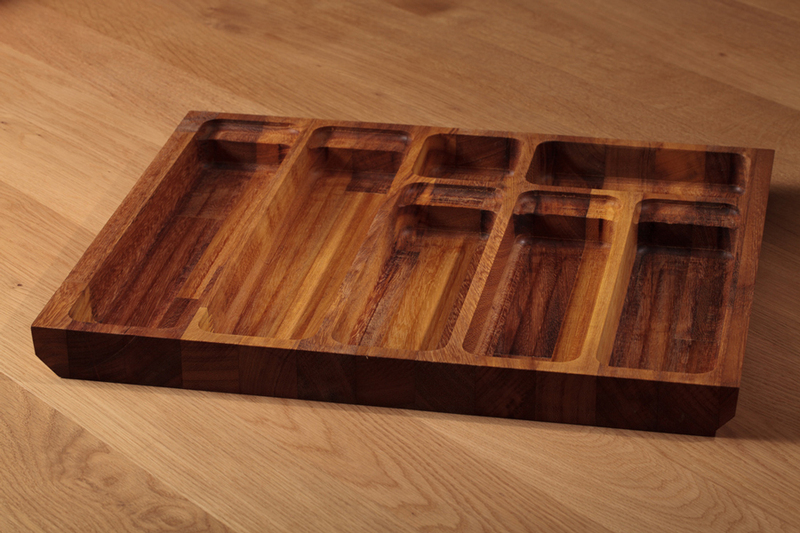 No two cutlery trays are exactly alike, thanks to wood’s natural qualities. Whilst we recommend ordering a cutlery tray insert to match your chosen solid wooden worktops, these trays are designed to fit almost any standard width kitchen drawers, so if you already have a kitchen you are proud of, why not complement it with one of these beautiful accessories? Please Note: This guide was originally published on March 6th 2015 and was most recently updated on June 13th 2018.